Crowds are on the rise, backed by powerful technology. The collaborative economy is a powerful movement. People are sharing goods, services, space, and money with each other. Also, they are crowd funding and making their own products outside of traditional factories. They are using powerful technologies, including social networks, mobile devices, the internet of things and mobile payment systems. In all cases, they’re getting what they need from each other, rather than from inefficient corporations. This peer-to-peer commerce economy is enabling the crowd to become like a company, disrupting traditional business models. It’s also going to double in adoption, says our recent report. Companies are joining the movement, partnering with the crowd. Innovative and bold brands have already joined in the movement, leading the charge to integrate the strategies of crowd funding, sharing and making into their own business models. Some early adopters, like REI, share the company revenues and equity with the crowd in their coop models. Other companies, like West Elm, Nordstrom and GE are allowing the crowd to design their products alongside them. Companies like Ford partner with Uber to give drivers discounts. Walgreens tapped TaskRabbit to deliver goods to homes, extending the brand promise. Lists are helpful in tracking industries. They help us to organize, analyze and predict where markets are headed. As such, I’ve been keeping a list of brands in the collaborative economy for about a year (along with help from submissions from the crowd, naturally). About ten years ago, we used to keep similar lists in the social media space. We used to track companies that started blogs, twitter accounts and more in the nascent “user generated content” movement. Fast forward ten years, the next movement is among us. As companies were disrupted by social media, they adapted. Companies disrupted by this new peer economy are also adapting. We’re at the start of another ten year run, and I’m 100% committed to helping corporations through this movement, as I launched Crowd Companies, an association for big brands only, to help them get involved, learn, and lead. The timeline graphic you see below isn’t complete. There are many other submission that are coming in, and more that I’ve missed. To help keep it updated, you can leave a comment on this post, or send me an email at info@crowdcompanies.com. To see this same graphic as a frequency chart, you can see the growth as companies quickly move in. Swisscom and Mila.com partnered for crowd-based services related to telecom. Thank you, Vladimir Mirkovic and Julie G., for your help in production and research. Thanks to Lisa Gansky, Fred Neil, Alexandra Samuel, Terry Young, Angus Nelson, and Vivian Wang for your insights. The above frequency chart (up till April 2nd, 2014) shows the instances of corporations who’ve deployed in the Collaborative Economy, based on this growing list. The Collaborative Economy Empowers Peer 2 Peer Commerce. I’ve written a fair amount about corporations in the Collaborative Economy, and have even started an association for large companies, called Crowd Companies. , so tracking this space is not just a passion, but core to my work. In a future post, I’ll list out the specific instances in a timeline, so you can further see how companies are moving into this space. This movement shifts power to the people – but brands aren’t idly standing by. 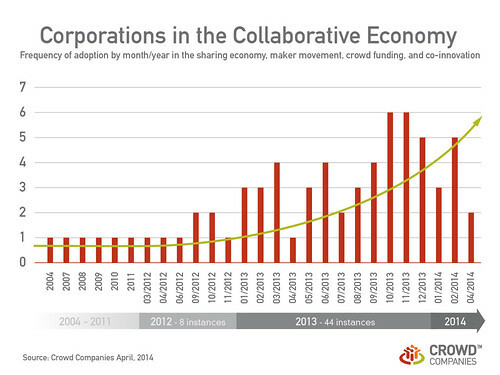 The Collaborative Economy is a powerful movement. The people can get what they need from each other through peer funding, making, 3D printing and by sharing goods, instead of buying them. This movement is disruptive. Some taxi companies’ revenues have dropped by as much as 40% where they are being displaced by the popularity of ride-sharing startups. Airbnb is now worth more than some traditional hotel chains. Airbnb is usurping the market dominance of hotels. Uber and Lyft are changing the paradigm of owning cars to sharing cars. Crowd funding shifts power away from banks. oDesk shifts power away from traditional consulting and Etsy shifts away from traditional retailers. Although much is still experimental, there was an increase in brands embracing the sharing economy in 2013. Just as they did with social media, companies will join, influence, and eventually participate in this movement. In 2012 there were a mere eight instances of corporations in the space, including Patagonia, partnering with eBay for used good resale, West Elm reselling maker goods from the Etsy community at retailers, and UK retailer B&Q launching a community to encourage sharing of goods at the local neighborhood level. In 2013 we saw much more adoption, with 44 instances of corporations moving forward with experiments, partnerships, sponsorships and more. Forecast: 2014 promises increased growth as the movement prospers. This P2P movement is growing. The graph below shows the Google Insights trends of people searching for this market, with a strong uptick to the right. Don’t expect corporations or their agencies and consulting partners to stand idly by. They’ll use the same tools and strategies this coming year and beyond. 2013 showed a 550% growth rate in some instances. If that rate continues, we could expect a whopping 242 new instances of corporate movement into this space in 2014. If current patterns repeat, we should see a bolstering in this space in the last quarter of 2014. 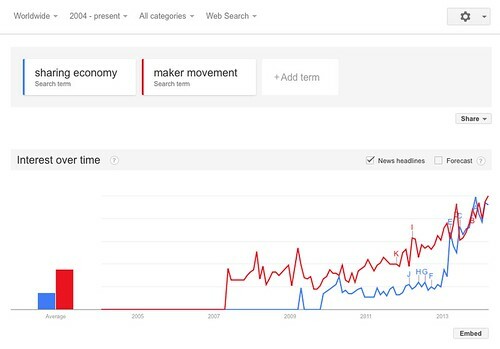 Above: Google Insights, which tracks how people are searching for terms, indicates a rapid rise in people searching for the terms sharing economy and maker movement, the two key trends in the collaborative economy movement which will trigger brands to follow the action. See the live graph. The first phase of sharing was social media. People created media and shared it, bypassing corporate-created content. In the second phase, the Collaborative Economy, people are creating products and sharing them without having to buy from companies. Read the full report on their behavior change. Companies must adjust their business model to partner with the empowered crowd. Thank you, Vlad and Julie G., for your help in production and research. Thanks to Lisa Gansky, Fred Neil, Alexandra Samuel, Terry Young, Angus Nelson, and Vivian Wang for your insights.